A female suicide bomber Friday struck a tent filled with women and children resting during a Shiite pilgrimage south of Baghdad, killing 40 people and wounding about 80 in the deadliest of three straight days of attacks against Shiite worshippers. The horrific assault - which appeared to be the deadliest in Iraq this year - demonstrates the determination of some extremists to re-ignite sectarian warfare and underscores how fragile security remains here, even as the U.S. turns over more responsibility to the Iraqis. No group claimed responsibility for Friday's blast, but suicide bombings against Shiite civilians are the signature attack of al Qaeda in Iraq, which U.S. commanders say has been severely weakened but not defeated. The attack occurred despite a massive security operation mounted by Iraqi authorities to protect the hundreds of thousands of pilgrims streaming into the Shiite holy city of Karbala for religious rituals that culminate Monday. But the vast numbers of pilgrims and the distances many of them must travel make it all but impossible to guarantee their safety against determined extremist groups willing to die. The blast occurred at midday along a dusty stretch of road flanked by palm trees alongside a railroad track near Musayyib, about 40 miles south of Baghdad. Along the routes to Karbala, separate tents for men and women have been set up to offer pilgrims food, drink and a place to rest. A procession leader, Mussa al-Kadhem, said he was drinking tea with a group of men when he noticed a "suspicious-looking woman" dressed in a full-body black abaya robe and with her face covered wander into the women's tent. "As soon as some people asked who she was ... there was a huge explosion," he said. Provincial health official Dr. Mohammed Abbas and the provincial police reported 40 people were killed and 81 wounded. Abbas said most of the victims were women and children. Casualty figures in Iraq often fluctuate but if the tally stands, it would be the deadliest attack in the country since a suicide bomber killed 36 people Jan. 4 at a Shiite shrine in Baghdad. Associated Press Television News video showed piles of clothing, small rugs and toddlers' strollers littering Friday's blast site. A dismembered leg believed to have been the bomber's lay wrapped in an abaya in a cardboard box. The attack occurred one day after a suicide bomber detonated an explosive belt packed with nails and killed eight people and wounded more than 50 in Karbala, 50 miles south of Baghdad. On Wednesday, at least 12 people were killed and more than 40 wounded in a series of bombings in Baghdad targeting Shiite pilgrims traveling through the capital to Karbala. Hours after the Friday attack, pilgrims mingled aimlessly around the site, many of them still dazed from the carnage. One man who refused to give his name held his dazed and injured son, who was wrapped in a red and yellow blanket. "What is my son's fault? What did he do? What kind of belief system do these people have? Are they monsters?" he shouted. Witnesses said many of the injured were hurt in a stampede as terrified survivors, many of them poor Shiites exhausted after days of walking, scrambled away from the scene in terror. "It was a horrific scene with dead and screaming injured people on the ground," said Sadiya Kadom, 40, a Baghdad resident who was near the tent when the blast occurred. Hussein Faris, 39, said he was injured in the stomach but his wife, who was walking behind him closer to the tent, was killed. "I was so terrified. People nearby were running in terror, and many got hurt in the stampede," he said at a hospital in nearby Hillah. U.S. officials have said violence has dropped by nearly 90 percent since the bloodiest days of 2006 and 2007, when Shiite-Sunni fighting pushed the country to the brink of all-out sectarian civil war. Last month's provincial elections, which were held without major violence, encouraged many Iraqis that the country was on the path to stability - which would allow the U.S. to withdraw its 144,000-strong military force. President Barack Obama, who promised during his campaign to remove all combat troops within 16 months, is studying plans to shift military resources from Iraq to Afghanistan, where a resurgent Taliban and al Qaeda have threatened the U.S.-backed government. But U.S. commanders have repeatedly warned that security in Iraq remains fragile because al Qaeda and other groups have not been completely defeated. Iraq's major religious and ethnic groups have not reached power-sharing agreements to ensure a lasting peace. Even though violence has fallen off, the number of female suicide bombers in Iraq has been growing. Last year, they attempted or successfully carried out 32 attacks, compared with eight in 2007, according to U.S. military figures. Iraqi authorities lack enough female police to search most women at sensitive sites. Women's loose-fitting garments make it easier to conceal explosives. Last month, police arrested a middle-aged woman, Samira Ahmed Jassim, for allegedly recruiting female suicide bombers. She told The Associated Press in a prison interview of a plot in which young women were raped and then persuaded to carry out suicide attacks to reclaim their honor. Pilgrims will be celebrating Monday's end of 40 days of mourning that follow Ashoura, the anniversary of the seventh-century death of the Prophet Muhammad's grandson Hussein. He was killed in a battle near Karbala for the leadership of the nascent Muslim nation following Muhammad's death in 632. 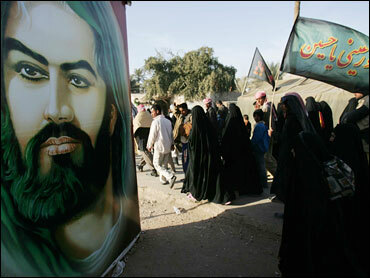 His death contributed to the split between Sunni and Shiite Muslims.